Market demand for electric vehicles has been steadily rising. Sometimes simply referred to as EVs, more and more consumers are getting plugged into the idea of alternative fuels. According to Bloomberg’s research organization New Energy Finance, as of November 2017, sales of EVs and plug-in hybrids were 63 percent higher than the same quarter one year prior. EVs and hybrids, however, aren’t the only option out there for the growing number of consumers that base their vehicle purchase decisions on the environment. Hydrogen-powered vehicles are shaping up to be a viable choice for green-minded drivers. In fact, Hyundai Motor Co. recently unveiled its second hydrogen-fueled vehicle at the Consumer Electronics Show in Las Vegas in January 2018. 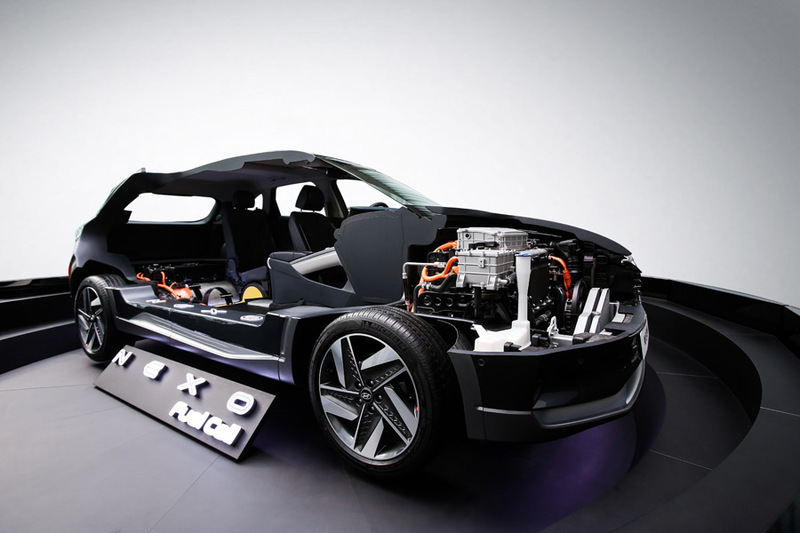 The Nexo’s dedicated architecture allowed the battery to be located in the trunk of the vehicle, which also allowed an innovative method for integrating the 12-V battery with the main battery assembly. On the southeastern shores of South Korea, Hyundai has been hard at work producing the cars of the future in the company’s Ulsan factory, the world’s largest automobile plant. Inside, Hyundai’s Nexo is being produced based on experience the company gained producing the Tucson, which served as its first foray into fuel cell electric vehicles, or FCEVs. Those unfamiliar with Hyundai’s new offering, or FCEVs in general, might be surprised to learn that the concept has been around since 1801. But it wasn’t until 41 years later that the concept was finally brought to fruition. In 1842, William Grove, a chemist, lawyer and physicist introduced the world’s first working fuel cell, which was dubbed a “gas voltaic battery.” The breakthrough proved that electricity could be produced by an electrochemical reaction between hydrogen and oxygen. Today, FCEVs are the mature version of the original gas voltaic battery, consistently and reliably converting hydrogen into fuel. 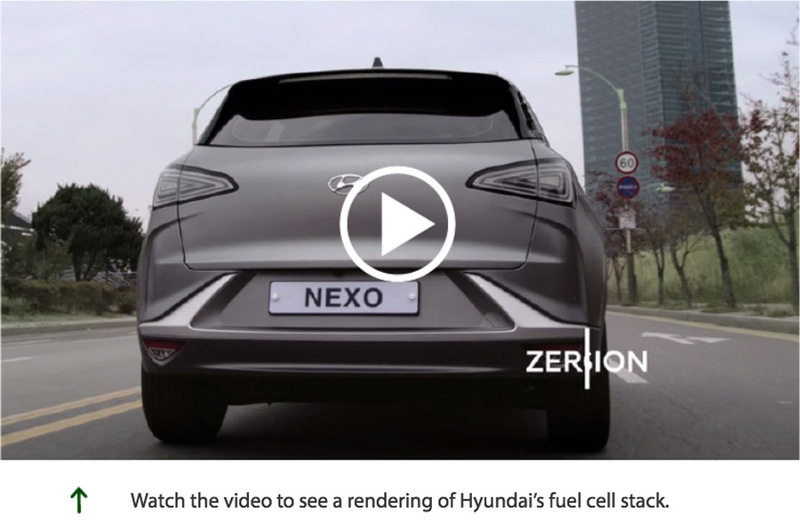 According to the U.S. Department of Energy, the most common type of auto fuel cell – the type that Hyundai is employing with the Nexo – is one with a polymer electrolyte membrane, or PEM. The process is incredibly efficient, and similar to EVs, PEM fuel cells produce incredibly low emissions – a major selling point for FCEVs. Generally, FCEVs emit nothing more than the water vapor described by the DOE and a small amount of warm air. Nexo is the second generation in Hyundai’s line of fuel cell electric vehicles. Improvements over the first generation’s fuel cell design push the car’s target range to an estimated 370 miles. Initially, hydrogen-powered cars were only available in select regions due to a lack of infrastructure for drivers, namely hydrogen fueling stations. For instance, the current generation of Hyundai’s Tucson was released in late 2013, but wasn’t available in the United States until June 2014. But, times are changing. Currently, there are 31 hydrogen fueling stations in California, but by 2020, up to 100 will be in service. That’s the goal of the California Energy Commission. As more manufacturers produce FCEVs, the infrastructure ultimately grows. With consumer interest on the rise and with the announcement of its Nexo, Hyundai is moving closer to mass production of FCEVs, which will, in turn, support the ambitions of the California Energy Commission and other similar organizations. 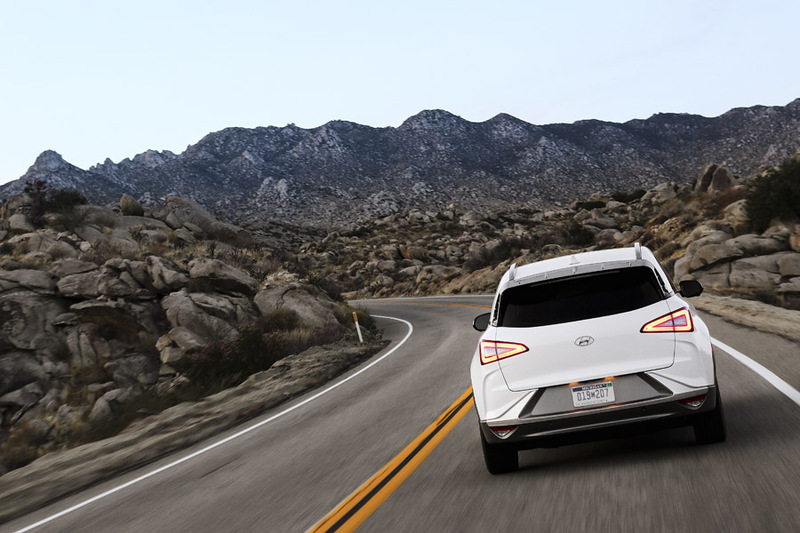 Jerome Gregeois, senior manager for PT evaluation and the eco department at Hyundai-Kia America Technical Center Inc., explains how Hyundai is ramping up interest. Hyundai’s first-generation fuel cell vehicle, the Tucson, in production at the carmaker’s Ulsan plant in South Korea. Despite Nexo’s all-new, dedicated architecture, the Ulsan plant didn’t require a major factory redesign. Despite being an all-new vehicle with a dedicated architecture, the Nexo didn’t require Hyundai to undergo a major factory redesign. 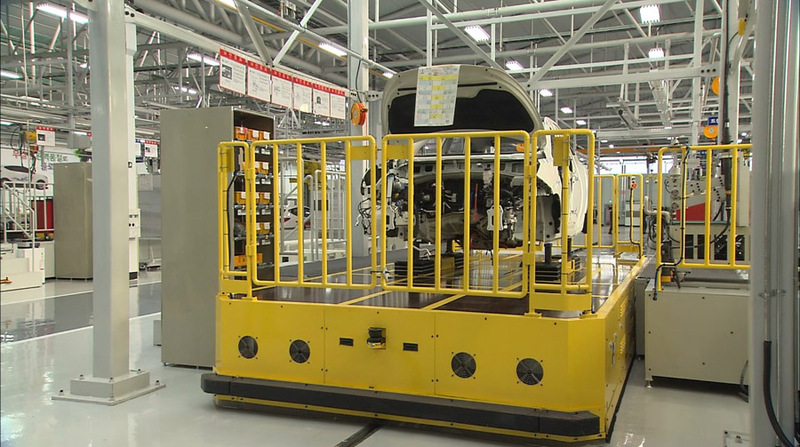 Other than a few retooling requirements, the company is well-positioned for full-swing production. According to Hyundai, the Nexo will be available in select markets later this year. In the meantime, consumers can anticipate advanced drive assistance systems, a lighter weight, improved power-to-weight ratio, faster acceleration and more cabin space with the battery located in the trunk. Compared to the Tucson, the Nexo shares a host of conceptual similarities, but the design of the fuel cell stack is slightly different. 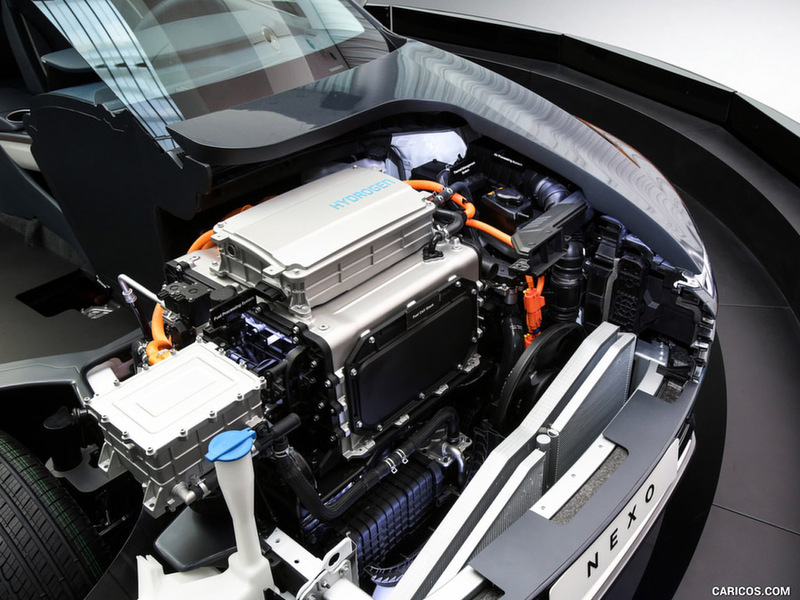 The stack, which powers the Nexo’s motor, is essentially a combination of multiple fuel cells. With more fuel cells, higher power – and longer ranges – can be achieved. Gregeois says that the stack’s design assembly is new, adding that the pitch of the stainless steel plates between the multiple fuel cells was reduced by 20 percent for an overall higher power density. The choice for stainless steel was based mainly on cost-efficiency. Compared to other manufacturing approaches that rely on titanium or other expensive plates, stainless steel is cheaper and easier to work with. Beyond the design changes to the stack itself, the elements around the stack have changed. The radiator for cooling, the flow of the coolant and the engine compartment all received a complete redesign. The Nexo’s fuel cell stack assembly was redesigned to reduce the pitch of the stainless steel plates between the multiple fuel cells and deliver a higher power density compared to its predecessor, the Tucson. The thermal management side, used for cooling, also has a new look. Its packaging, a number of the components, such as valves, and the layout were all re-envisioned. For further packaging purposes and to reduce the overall weight of the vehicle, the separate motor and inverter were integrated into one. As is true with the automotive community as a whole, Hyundai’s cars are designed with lightweighting in mind. The Nexo is no exception. 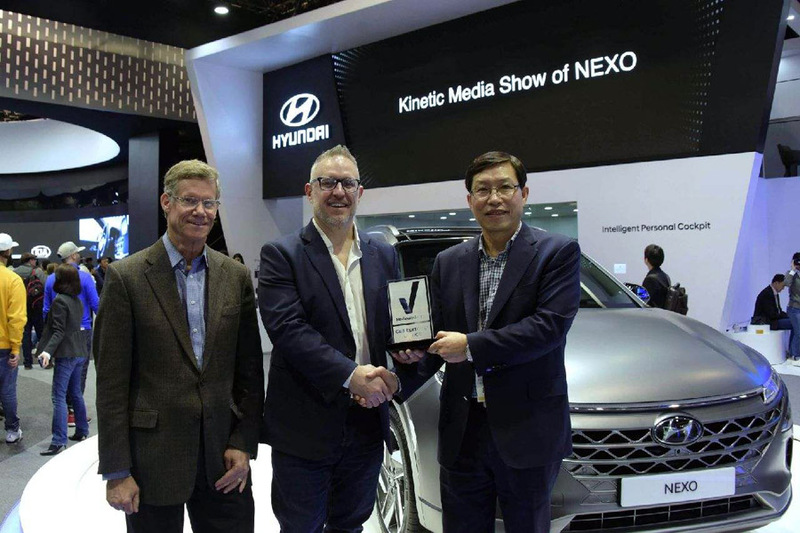 Hyundai’s 2019 Nexo fuel cell electric vehicle wins Reviewed.com Editors Choice Award for CES 2018. With plans to develop a larger fleet of low emission vehicles, Hyundai will continue to solidify its leadership role in manufacturing low-emission vehicles. Hyundai Motor Group, the multinational conglomerate that includes Hyundai Motor Co., Kia Motors and Genesis Motors, plans to introduce 38 eco-friendly models by 2025. The popularity for the Nexo and other FCEVs could also rise if more consumers do something as simple as take one for a test drive. Getting behind the wheel of a Nexo can help to remove some of the stigma that might be attached to alternative-fuel vehicles. In addition to an improved power-to-weight ratio and faster acceleration, the Nexo boasts the same level of durability as an internal combustion engine vehicle.